It's been more than a year since I last visited Au Wing Kee. To make things confusing, there are 2 locations of Au Wing Kee, both on Kingsway. We went to the Burnaby location because it was on the way home for Gordo. Oh and yah, it's open until 1:00am, which is a good thing since we had just finished up our Friday night hockey game at 11:00pm. Yes, late night options are dwindling. Now, Au Wing Kee has been in the news the last year for all the wrong reasons. You see, in CTV's report of the dirtiest restaurants in Vancouver, Au Wing Kee made the list. I'm sure most people are wondering why more Chinese restaurants don't make the list. After all, it is almost a given that we'll find the nastiest, dirtiest and oiliest washrooms in a Chinese establishment. Oiliest??? Yes, haven't you even walked into a washroom and the tiles are just plain slippery? Do they mop their floors with leftover grease? I mean, as I stand there doing my business, I find my legs spreading wider and wider apart as I struggle to keep my aim. C'mon, some of you must've experienced this before! And yes, the washrooms here fits the aforementioned criteria. So off we went, in hopes that they have cleaned their act up. Well, whatever the case, I think we've developed strong enough immunity by eating often at these places. Au Wing Kee is also up for the "narrowest parking lot for people who may not necessarily be able to park in them" award. I really didn't want to park at the rear lot; but the precious few spots in the front were all taken. I gingerly backed into the furthest spot and met up with Gordo and Milhouse inside. 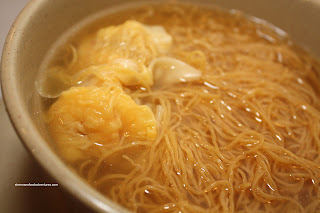 We ended up sharing 3 dishes; however, I got an order of Wonton Noodles and congee for "research purposes". Believe it or not, for all the times I've eaten here, I don't recall having the wonton noodles. These were decent. Flavourful broth, chewy thin noodles and predominantly shrimp wontons (a bit small though) made for a satisfying eat. 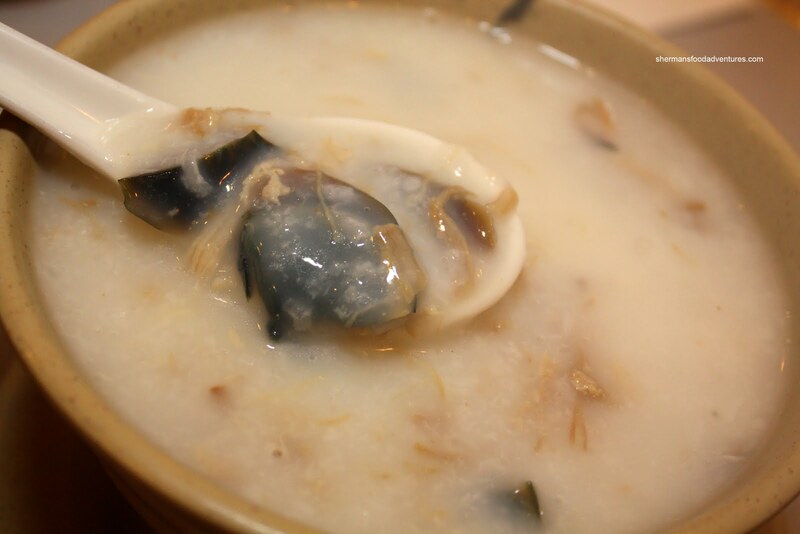 The Preserved Egg & Salted Pork Congee was also pretty good. Slightly thin, the congee had a nice tangerine peel taste. Plenty of duck egg and shredded salted pork as well. Now to the sharing dishes... The Beef Fried Flat Rice Noodles were not too oily and properly seasoned. 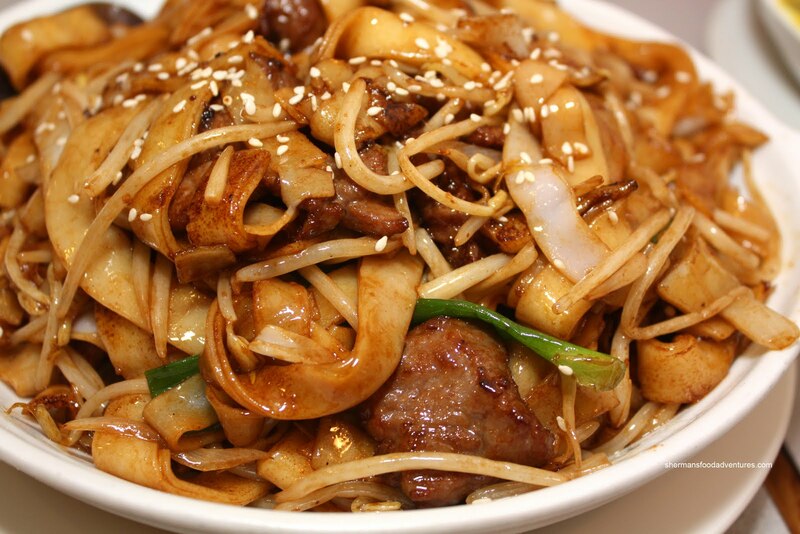 Lots of tender beef while the noodles retained their shape . 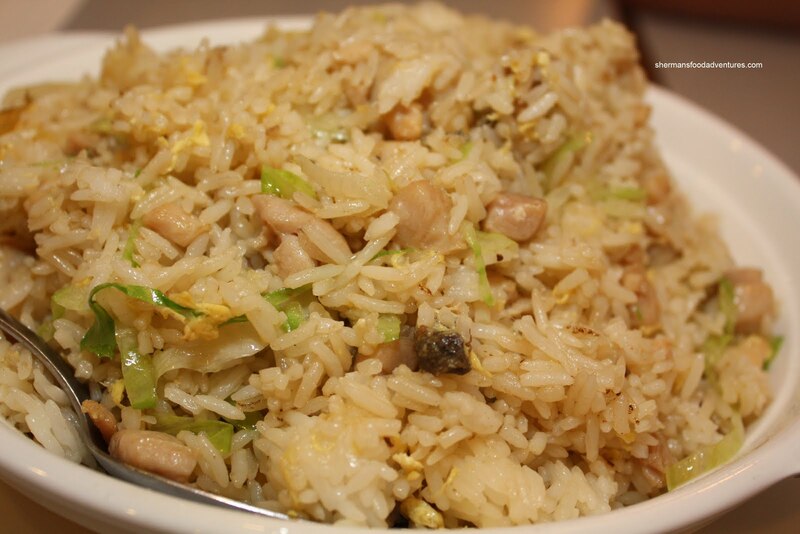 When there is Milhouse, there is Salted Fish & Chicken Fried Rice. This version was good, if not needing a bit more saltiness. Rice was firm except for a few clumps. 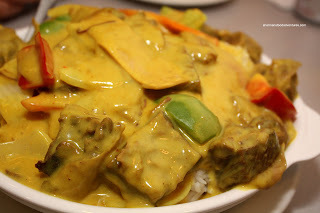 Lastly, we shared the Curry Beef Brisket on Rice. For $6.95, this was a huge portion of tender (not too fatty) brisket bathed in a mild curry with a hint of coconut. Hey, we weren't really sure if the place was all that much cleaner; but the food was good, prices were low and portions huge. Perfect for late night eats. Oh boy, that was hilarious about the oil-slick bathrooms. I am very conscious of that at restaurants in some part from my parents having a restaurant and slipping a little in the kitchen during dinner rush. But in the bathroom... nasty! I shudder to remember my only time dining in at On Lok (new in town, didn't know better) and the dining room floor tiles were oily and random strands of hair were trapped in the grease!! Yes yes and yes, it happened to me exactly the way you discribed it "a la" oil slick in washroom...you are so GOOD is all these details be it good or bad!! @SFF I think the char or wok heat for the noodles were fine. I've had some with too much char and it tastes burnt. @wyn Ugh... hair and oil. That's worse!